Joe Our goal today was simple: we wanted to get out to Suomenlinna, the island fortress which guards Helsinki's harbor. This is not actually a difficult thing to accomplish from Helsinki, so we opted for a slow start to the morning. Consequently, it was just gone 9 when we showed up to the hotel breakfast buffet. We've never actually had a Finnish breakfast buffet, butof course it was not too different from what we've come to expect everywhere else. There were no waffles or pancakes, which isn't so unusual but worth noting, and the only additions were some very dark flatbread, some Karelian rice pastries, and a crock pot of hot porridge. The Karelian pastry is a thin pastry shell wrapped around some cooked rice; say what you will about the Karelians, but they don't appear to be big fans of the concept of flavor. The terminal also has a HKL ticket machine, from which I bought us a pair of one day tourist tickets. Then we hopped a number 4 tram into town, hustled across Kauppatori (the Market Square) and managed to catch a ferry to Suomenlinna with approximately 3 seconds to spare (they run only about every 40 minutes or so). 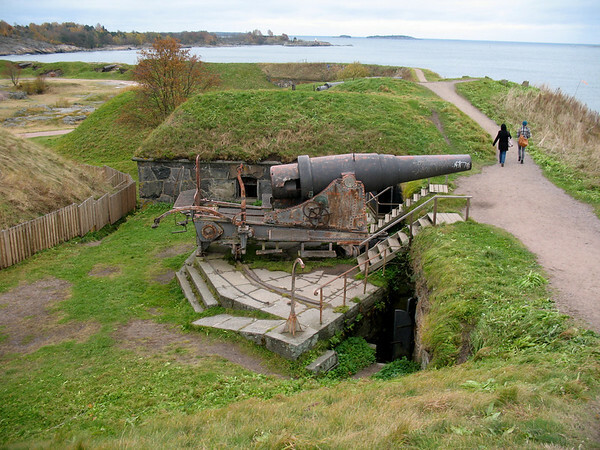 Suomenlinna (or Sveaborg if you're a Swede (which transliterated into Finnish becomes Viapori)) is a massive fortress. Built at the command of Gustav III Vasa, it was the largest construction project Sweden had ever undertaken. 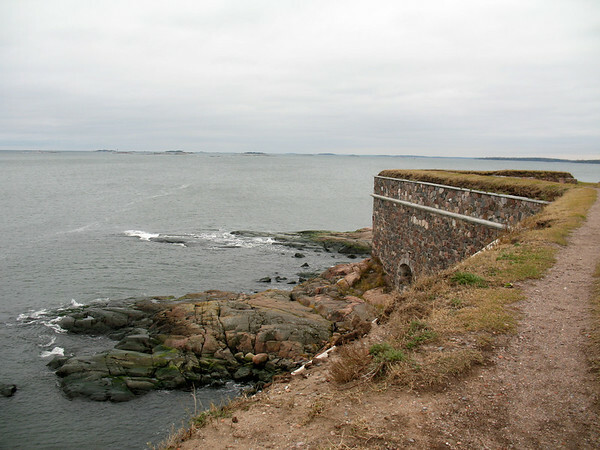 It actually spans a series of five islands at the mouth of Helsinki harbor. In more than one sense, it is the reason for the existence of Helsinki. Gustav's order also created the city (as an attemp to wrest the Baltic Sea trade away from Tallin, and hence the Hanseatic League)—the fact that neither the city (originally sited too far upriver, it had to be moved forcibly within decades of its founding) nor the fortress (while it did survive the first two attempts by the Russians to take the city, this was mostly due to the fact that the invasion fleets were turned back by the pack ice) proved particularly successful was but a temporary setback. 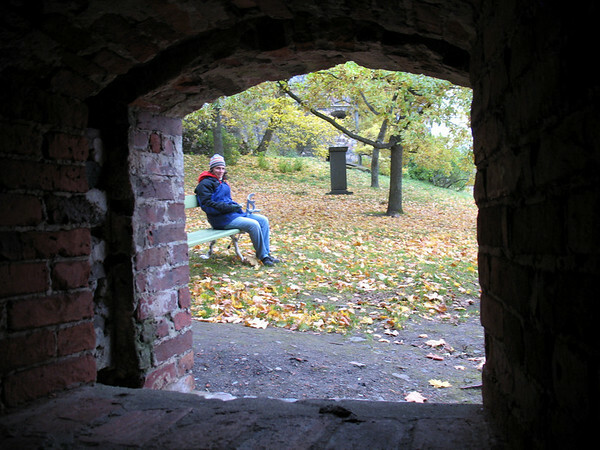 After the fortress surrendered to the Tsar Alexander in 1808, he declared Helsinki the capital of the Grand Duchy of Finland, and the 17,000 troops he stationed there immediately turned Helsinki into a massive garrison town which led to its rapid expansion and ultimate success. The ferry docks at the most built up quarter, so for a while we followed rough cobblestone streets as the wound between the old wooden warehouses and the Orthodox church and lighthouse. Past the museum and visitor center the walled town gives way to more serious fortification; another kilometer beyond that there's nothing but stone walls and abandoned artillery staring forlornly out across the Baltic. In the summertime the islands are crawling with people, locals and tourists both, clambering over the grass covered dunes and exploring the rabbits warren of tunnels and casements beneath, interspersed with a swim off the rocks or a picnic. For my money, though, we had it better in October: the outer reaches had a sort of wind-swept allure, and the courtyards and alleyways were mostly populated by eddies of yellow oak leaves, with the occasional human visitor thrown in for good measure. At 3:40 it was time to catch the ferry back to the mainland, and from there a tram out to Katajanokka, there to trade in our key for our luggage. As we walked down the (absurdly long) gangway to the ship, we were treated to a parting view of the city—those parts of it not lost behind the sudden downpour we had been dreading all day. Time to get out of Helsinki.